Dental Implants – Taylor Family Dentistry ? Our goal is to provide our patients with the highest quality oral healthcare possible and to create beautiful, lasting results. Our team focuses on this goal daily in our Indianapolis office. This page provides more information on dental implants and how they can help improve your smile. 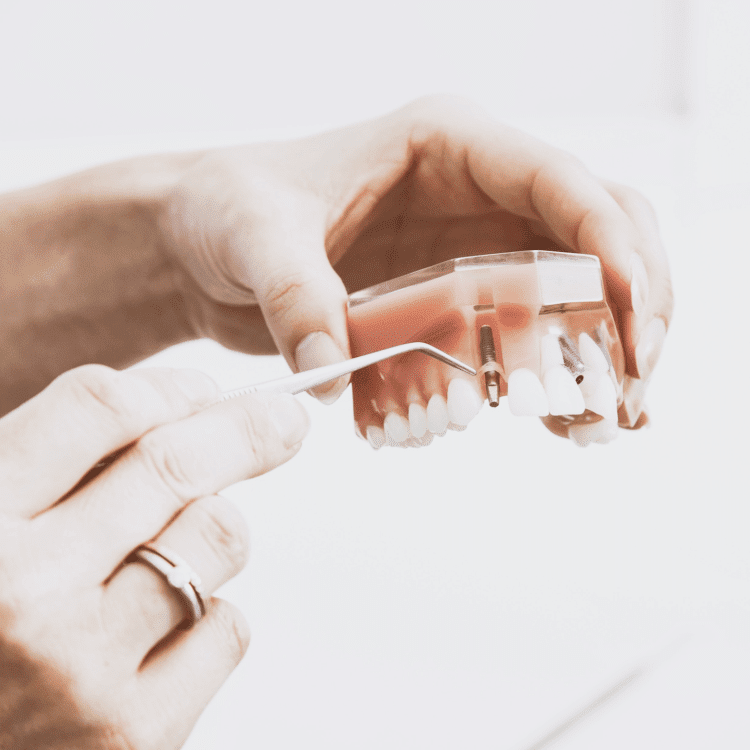 If you have any additional questions regarding dental implants or any other dental treatment you may need, please contact us or make a no-charge consultation appointment online easily on our website. We’re happy to help! A dental implant provides several advantages over other tooth replacement options. In addition to looking and functioning like a natural tooth, a dental implant replaces a single tooth without sacrificing the health of neighboring teeth. The other common treatment for the loss of a single tooth, a tooth-supported fixed bridge, requires that adjacent teeth be ground down to support the cemented bridge. Because a dental implant will replace your tooth root, the bone is better preserved. With a bridge, some of the bone that previously surrounded the tooth begins to deteriorate. Dental implants integrate with your jawbone, helping to keep the bone healthy and intact. First, the implant, which looks like a screw or cylinder, is placed into your jaw. After a couple of months, the bonds to your tooth to form an anchor for your artificial tooth. During this time, we will design a temporary tooth replacement that can be worn over the implant site. After the healing has taken place, we will uncover the implant and attach an extension. This small metal post, called an abutment, completes the foundation on which your new tooth will be placed. Your gums will be allowed to heal for a couple of weeks following this procedure. Finally, we will have the laboratory create a crown for you that will attach to the abutment. You will experience restored confidence in your smile and your ability to chew and speak. Dental implants are so natural looking and feeling, you may forget you ever lost a tooth. When restoring a missing tooth in the esthetic zone, special considerations are made to enhance the final result. The procedure is the same as it would be for a back tooth, but the materials used in the front are different. We prefer using a tooth-colored abutment (post) and an all-porcelain crown. These materials allow us to provide you with a durable restoration that blends in seamlessly with your dentition.